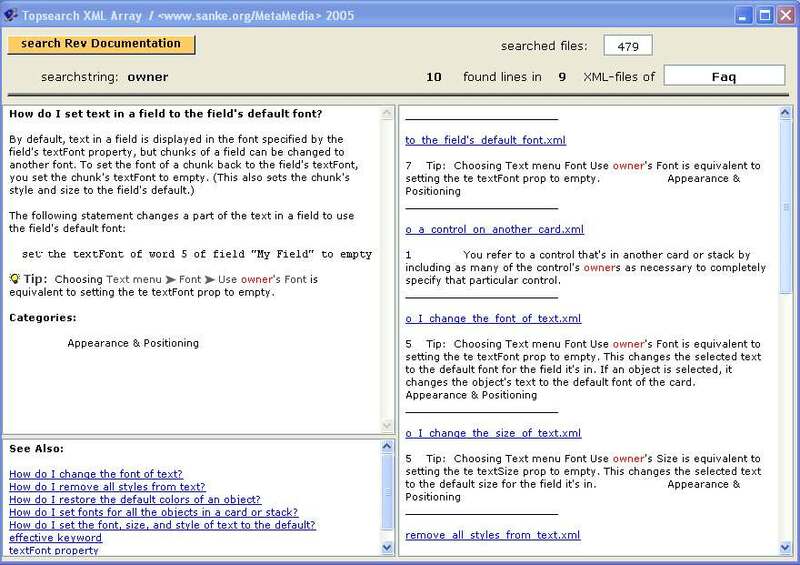 SearchDocs XML is now available. 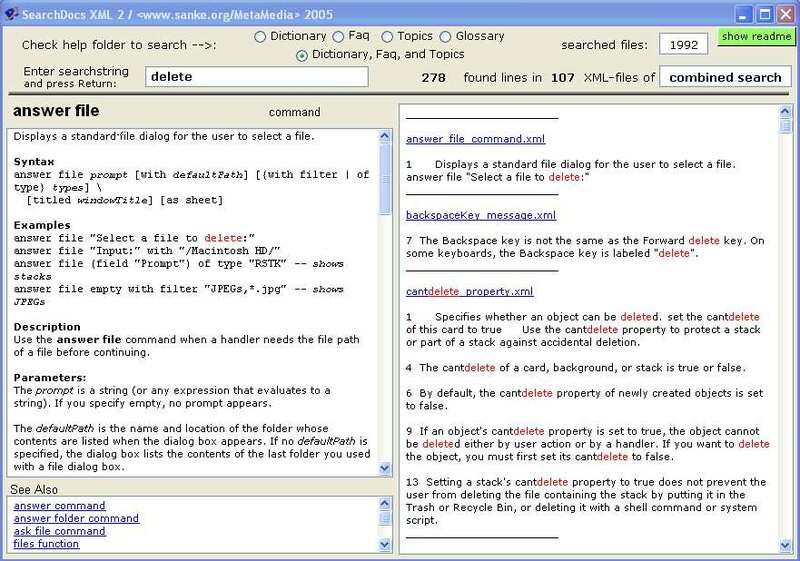 Any searchstring can be used, single words or a sequence of words (like "move the insertion point"), which is not possible with the filter and search routines of the Rev Documentation. The "Dictionary"-, "Faq"-, "Topics"- and "Glossary"-folders of the Revolution "Help" directory can be searched. The results are displayed in the field on the right with the searchstring colored and the XML-file addresses inserted as links. Clicking on such a file link displays the complete article in the left field - again with the searchstring colored. If the article itself contains links these are again displayed for further inspection. If one of the links points to to a stack in the "reference" folder, this stack will be opened when clicking on the link. Select a folder for the search by checking one of the radio buttons. One option of the latest version is to search folders "Dictionary", "Faq", and "Topics" at the same time. This will slightly increase the search time - to about 160 milliseconds on the average for the 2000 XML files together (measured on a WindowsXP computer with 2 GHz). Folder "Glossary" is not included in this combined search as it only fulfils the function of a lexicon of "Transcript" terms, but it can be searched separately. Average search-and-display-time is less than 100 milliseconds (for the total 1496 files of the "Dictionary") on a WindowsXP computer with 2 GHz and somewhat more - but still below 200 milliseconds - on a Mac G4 with 667 MHz. New "copy" feature: Text can be selected in the fields on the right and left using the mouse ("traversalon" is set to true for this two fields). Then apply the usual copy-and-paste procedures from the Menubar or through keyboard shortcuts, e.g. CTRL-C and CTRL-V on Windows. Metacard user need to copy the Revolution Help folder into their main folder of the MC IDE. For cosmetic reasons - to be able to display some of the inserted Rev icons - one should also copy stack "revicons.rev" into the Metacard folder. Revolution users must place their version of "SearchDocs XML.rev" in the same folder with "Revolution.exe" (Revolution.app in MacOS) to work properly. 1. When the learner types into the input field, the typed letters disappear from the scramble field. Only letters contained in the scramble field can be typed into the input field, otherwise a "warning" will appear. 2. If the user deletes letters from the input field, they reappear in the scramble field; the learner can move the cursor inside the input field using the arrow keys, then press the backspace key to remove the letter on the left of the cursor. 3. You can re-scramble the word to possibly get a better idea what the word could be. 4. Pressing "Help" shows the first and last letter of the sought word and displays dashes as placeholders for the remaining letters in between. 5. Button "more letters", which appears after first pressing button "Help", adds more - randomly selected - letters to the help field. The last two dashes in a word however remain, the user has to find out them on his/her own. "Simple" as it is, the exercise card of the stack needs 25 controls to achieve the described basic functionality and 8 of them contain scripts. The longest script is that of the input field, which controls the features 1. and 2. explained above. This script makes use of the "offset" function, "returninfield" and "rawkey" handlers, and the "selectedchunk" function, the last one to determine the place of the insertion point in the input field. A special problem comes up when you have to deal with special "national" characters, because the "rawkey" values in this case are different from the "numtochar" values; therefore I included some script lines to take care of the German "Umlaute" (ä, ö, ü). b) to add the possibility to export the lexicon to an external text file and to import from a choice of external files.